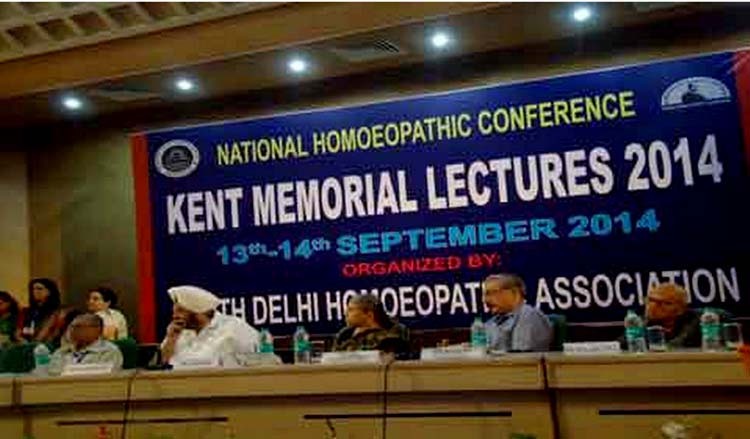 NEWDELHI.SEP.14: The South Delhi Homoeopathic Association has organized a National Homoeopathic Conference, “Kent Memorial Lectures 2014” at PHD House, Institutional Area, Hauz Khas, New Delhi. Dr. N. Radha, Advisor in Homoeopathy, Govt. of India, Ministry of Health & Family Welfare, Dept of AYUSH, was the Chief Guest of the conference. Dr. R. K. Manchanda, Director General, CCRH, Dr. Ramjee Singh, President, CCH, Dr. S.P.S. Bakshi, Vice President, LMHI, Shri. A.P. Frank Noronha, Director General (Media & Communications), Press Information Bureau, Govt of India and Padmashree, Dr. Kalyan Bannerjee, Patron of SDHA also graced the occasion with their presence. “The Government is committed to promote all the systems of medicine on the basis of their strengths in healthcare”, said Dr. N. Radha on inauguration. She assured that the Dept of AYUSH will introduce various schemes for augmenting promotion and development of Homoeopathy in the country. The theme of the conference was “Cracking the anxiety disorder”. To discuss this many senior homeopathic doctors presented their papers. Prof. Dr. L.M. Khan, Ex-Director (In-charge), NIH, Kolkata spoke on the topic “Cracking Whole through Hole”. Prof. Dr. Pankaj Aggarwal presented his papers on “My Experience of Treating Pain in Homoeopathy”. Prof. Dr. Neeraj Gupta, Prof.Dr. Bipin Jethani and many other experienced Professors and Doctors were among the panel to discuss about the anxiety disorders, its types and how Homoeopathy can be a cure to this disease. Observing that life today is becoming more and more mechanical; Dr. R.N. Wahi of SDHA said man is unable to cope with the day-today stress associated with it. This, he said has started taking toll on his health and physical well-being. Dr. R.K. Manchanda, said, "Till now, the benefits of homeopathy were established through observational studies. Now, we are validating them through randomized and controlled trials and fundamental research.”He pointed out that Homeopathy is not merely treating isolated sets of individuals, but the public as a whole. These days allopathic doctors are using thousands of antibiotics to treat very simple diseases. And due to overuse of antibiotics, when some big health problems happen medicines don’t work on patients’. He said antibiotics are mainly misused to treat allergy-related diseases such as asthma, skin inflammations and atopic dermatitis, which occur very often. ‘In homeopathy there are around 200 medicines for a single disease. If standard practices are followed, then people can avoid side effects,’ he said. He added that chronic diseases such as cancer and even Ebola can be treated through these medicines. Now the Homeopathy can prove to play a pivotal role in improving the public health scenario in the world. Homeopathy is a complete system of medicine that treats mental, emotional and physical illness. It can be used effectively by everyone, from babies to children to adults, including women during pregnancy too,’ says Dr. Shreepad Khedekar. The teachers, professionals and students from all over the country participated in the event.